Juan Melé attended the Escuela Nacional de Bellas Artes Manuel Belgrano and the Escuela Nacional de Bellas Artes Prilidiano Pueyrredón, Buenos Aires, from 1939 to 1945. In 1946, interested in concrete art, he joined the Asociación Arte Concreto-Invención and participated in its third exhibition (Sociedad Argentina de Artistas Plásticos, Buenos Aires, 1946). 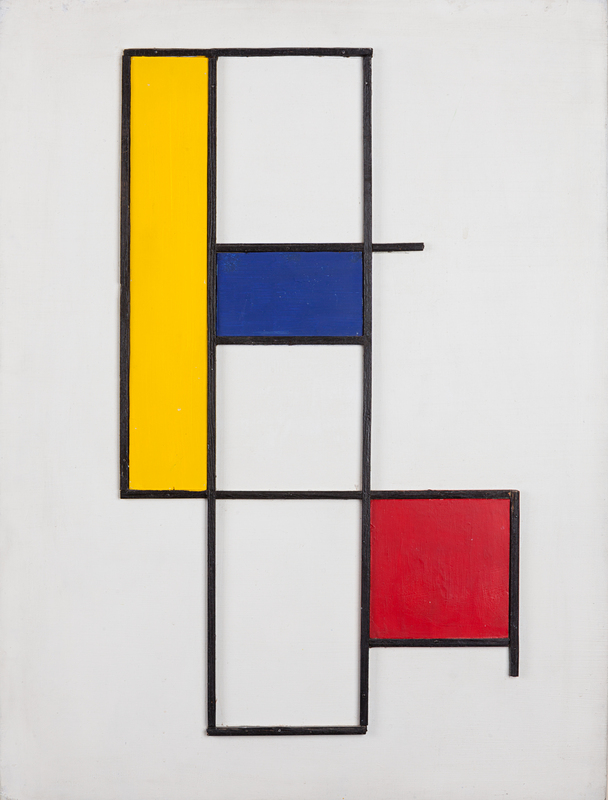 His first concrete works were Homenajes a Piet Mondrian, which imitated works by the Dutch master constructing fields of color with oil painted wood cuts separated from each other by black strips. His search for the ideal of making painting the object and suppressing representation continued with his Marcos recortados and Coplanares, in oil on wood. In the first series, the color fields were separated by heavy diagonal black lines; in the second series, they were separated by space but stayed on the same plane. Abolishing in Coplanares the idea of using the frame as a container, Melé experimented taking the aesthetics of Suprematismo to the coplanar disposition with Formas sobre el plano (1947). By this route, his investigation led him to produce tridimensional works called Planos en el espacio real and Objetos espaciales, in which he returned to the backgrounds and orthogonal frames −whether on bi-dimensional paintings or on variants of Coplanares with geometric forms adhered or floating on a neutral surface that looked like a “portable wall”. In these last works he tried to evade the risky conditions in which the background was placed on his first Coplanares. He participated at the Salón de Nuevas Realidades (Galería Van Riel, Buenos Aires, 1948). During a trip to Europe in 1948-1949, he participated in the Première Exposition des Artistes d’ Amérique Latine à Paris (Maison of l’ Amérique Latine, Paris, 1949) and met the leading constructivist and concrete artists. When he returned to Buenos Aires in 1950, color became the predominant element of his painting, particularly in the series Invenciones, invading the previously neutral planes or dominating the composition’s structure. In 1954 he founded the Asociación Arte Nuevo with Aldo Pellegrini and Carmelo Arden Quin . 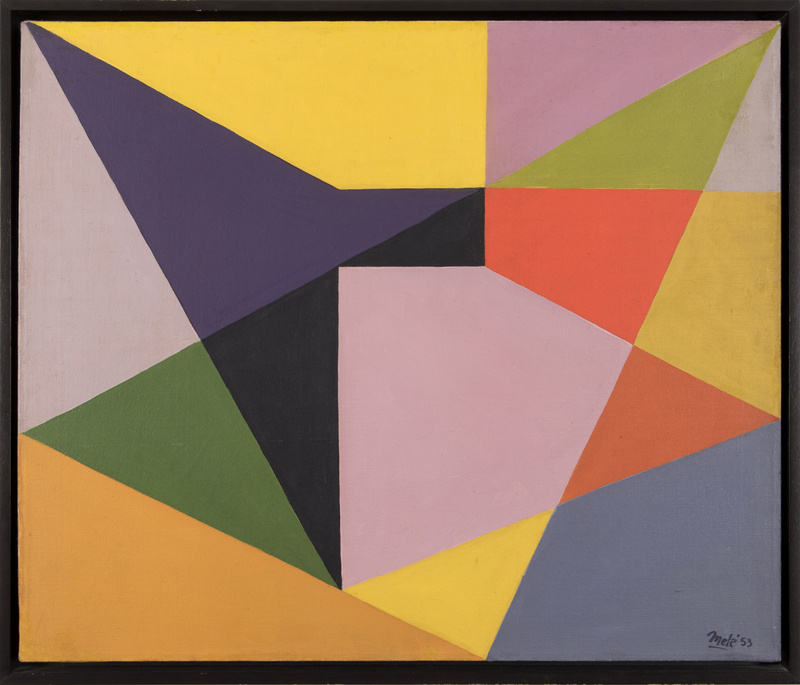 Personal reasons kept him away from artistic production during the 1060’s, but towards 1971 he began a new series of Invenciones in which he superposed diagonal segments over orthogonal geometric forms and flat backgrounds, granting rhythm and dynamism to the compositions. In 1973 Juan Melé moved to New York. In his new paintings of intense chromatic quality (among them the continuation of Invenciones), he experimented with dynamic and optical effects creating works that crossed orthogonal forms with lines and diagonal bands. During this stage he also worked on sculpture, a genre in which he moved with great freedom without being tied to any specific theory. Juan Melé returned to Buenos Aires in 1986 and the following year he presented an important one-man show at the Museo de Arte Moderno. By then, his Invenciones had reached a new momentum with the Serie negra, that distanced themselves from preceding chromatics. In 1989 after a visit to Paris he created another group of Invenciones in which the orthogonal forms and the simple colors dominated the composition. Parallel to these works he developed a series of Reliefs in which the planes were complex elevations or depressions, created from cuts or openings, and become concave or convex. The exhibitions of this period including the group show, Latin American Artists of the Twentieth Century (Museum of Modern Art, New York, 1992) and the one-man shows Juan Melé. A constructive investigation (Fundación Banco Patricios, Buenos Aires, 1995) and Juan Melé o el arte constructivo en los 90 (Centro Cultural Borges, Buenos Aires, 1999). These exhibitions strengthened Juan Melé’s national and international reputation. Asociación Arte Nuevo- Group founded in 1955 by Aldo Pellegrini and Carmelo Arden Quin, who were joined among others by Juan Melé, Luis Tomasello, Eduardo Jonquières, Gregorio Vardánega, Martha Boto and Rogelio Polesello. With the goal of researching and spreading modern art, they published (until 1958) a periodical newsletter and they organized the Salón de la Asociación Arte Nuevo (Hall of the New Art Association), which was held annually until 1961. The infiltration of informalism at the events organized by the Asociación put an end to its activities.